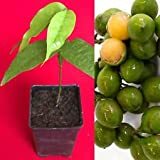 Mamoncillo growing tree of the genus Nephelium also known as Spanish lime or Limoncillo, Mamoncillo perennial evergreen to semi-deciduous plant, used for the edible fruits and as shade tree, grow in tropic, mediterranean or subtropical climate and growing in hardiness zone 9+. Leaves are green ovate when the leaves start to grow in red color. Flower color are white the size 1-2 mm the flowers can separate to female and male flowers on separate trees or on the same trees. Fruit are cover with thin skin with, color of the skin green, that pilled easily the flesh is white-pink with special structure remind little bit onion, some cultivar are easy to take off the seeds most of cultivars hard take of the seeds, the fruit taste are sweet with sour and remind the Lime with Lychee fruits the size of the fruit is 2-4 cm the shape and the color remind the lime structure, the trunk is wide, seeds also edible. What can be done with big quantities of Mamoncillo fruits?